Richard Dawkins, the world’s most famous atheist, highlights two books as particularly significant. Says he, “If On the Origin of Species [by Charles Darwin, 1859] was biology’s deadliest blow to supernaturalism, we may come to see A Universe From Nothing [by Lawrence M. Krauss, 2012] as the equivalent from cosmology. The title means exactly what it says. And what it says is devastating.” (From Dawkins’s Afterword in Krauss’s book, published by Simon and Schuster in 2012). Hopefully Dawkins has memorised Krauss’s full book title. Dawkins was left red-faced on BBC Radio 4 in 2012 when he couldn’t remember the full title of Darwin’s Origin Of Species while trying to score points about Christians who cannot remember details about Christian theology. Having read Krauss’s 191 page book, one discovers it to be nothing more than a grand exercise in smoke and mirrors. 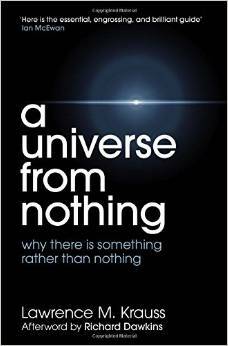 Only five pages in his book (p. 174-178) directly address the central question of how “everything came from nothing”. From Krauss’s final paragraph in that section we read, “Something may always come from nothing. It may be required, independent of the underlying nature of reality. Or perhaps something may not be very special or even very common in the multiverse.” Precisely. I urge readers to take a look at a devastating book review of Krauss’s A Universe from Nothing written by philosopher Peter S. Williams. He does a grand job of exposing Krauss’s errors of logic, his adherence to the bankrupt idea of logical positivism and his arrogant atheistic bias. The fact that Richard Dawkins so highly recommends this book speaks volumes.